acropolisRECORDS and X 103.9 are taking over Bear Mountain Sunday, January 23. 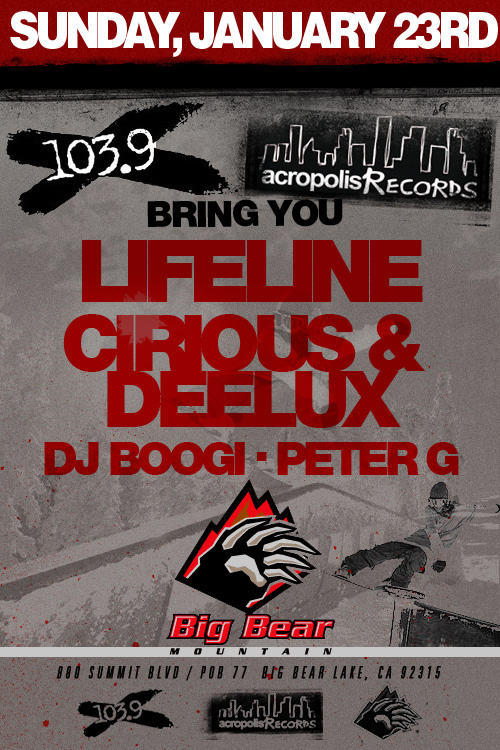 LIFELINE, CIRIOUS&DEELUX, DJ BOOGI and PETER G will be performing slopeside providing the soundtrack for your shredding pleasure. Grab your skis or board and come session! Bands start at 11 a.m. This entry was posted in NEWS and tagged acropolisRECORDS, Bear Mountain, Big Bear, Cirious&Deelux, DJ Boogi, Lifeline, Peter G, Ski, Snowboard, X-103.9. Bookmark the permalink.